HARTFORD - On a small revolving stage, a dark comedy is being offered as the summer offering at TheaterWorks in Hartford. 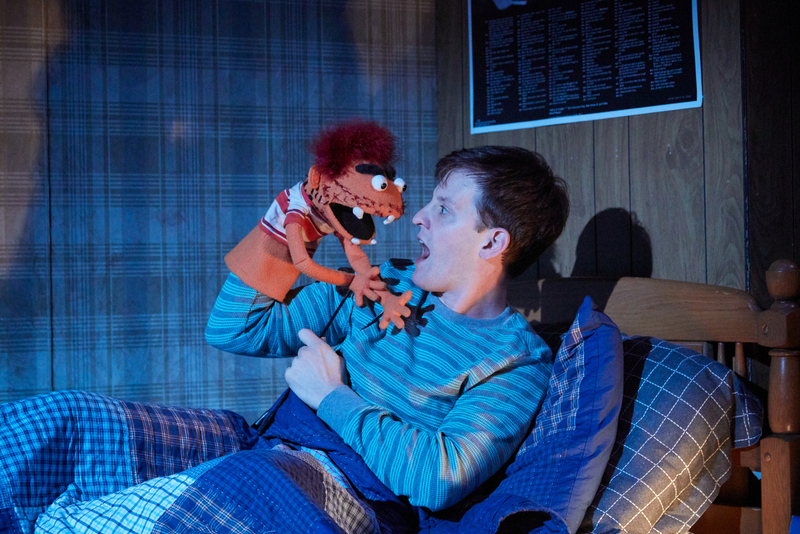 Hand to God, written by Robert Askins and directed by Tracy Brigden, is the deeply affecting story of a troubled teenage boy and the puppet that speaks for him, whether he wants it to or not. The role of Jason and his loud mouthed, inappropriate alter ego puppet, Tyrone, is played to absolute perfection by Nick LaMedica. This is an intense role requiring nearly simultaneous duality. Mr LaMedica plays the timid and repressed Jason, who has recently lost his father and feels disconnected from his equally traumatized mother Margery (Lisa Velten Smith), with commitment and skill which is impressive and masterful. In his state of withdrawal, Jason creates an angry puppet in his mother's church school class. Classmates Jessica (Maggie Carr) and Timothy (Miles G. Jackson) are in various stages of creating their own puppets for a church performance. Lonely and libidinous, Margery is seduced by the lascivious and immature attentions of wild child Timothy, while rejecting the awkward and yet more suitable advances by Pastor Greg (Peter Benson). She has reached a breaking point and none of her actions make sense. Pastor Greg, meanwhile, tries to make sense of the freak show that has become of his parishioners, yet is himself part of the act. The lone voice of reason is Jessica, who is played with a matter of fact honesty, compassion and humor by Maggie Carr. She imbues her character with a nature which is both relatable and admirable. Mr Jackson gives his Timothy a youthful swagger layered with a fragility which is both funny and sad. His amorous feelings for Margery are overt and comical. Her response is consistent with the nature of her experience. A strong performer, Ms Velten Smith demonstrates Margery's pain by biting and clawing at anyone who comes near. Her rabid behavior is so thorough there is little else offered by which to understand who she is. Raunchy humor and bizarre couplings are all part of this unsettling and yet very funny play. The staging by Ms Brigden is superb. The energy and urgency of the characters is evident in their kinetic interactions. The revolving set, designed by Luke Cantarella, provides for frequent and varied scene changes which always return to the room where it all happens, a playful room in a parish hall which is anything but a sanctuary. The quality of the performances must be seen to be appreciated. The actors were more than deserving of the standing ovation which greeted their bows. Performances continue August 26. Curtain is Friday and Saturday at 8 pm, Tuesday through Thursday at 7:30 (Tuesdays are also Talk Back performances), and Saturday and Sunday afternoons at 2:30. Parents are cautioned that "TheaterWorks produces plays that reflect the contemporary world. They frequently contain adult content and language," according to the company's website. TheaterWorks Hartford, at 233 Pearl Street in Hartford, can be reached at 860-527-7838 or theaterworkshartford.org for reservations and additional information. 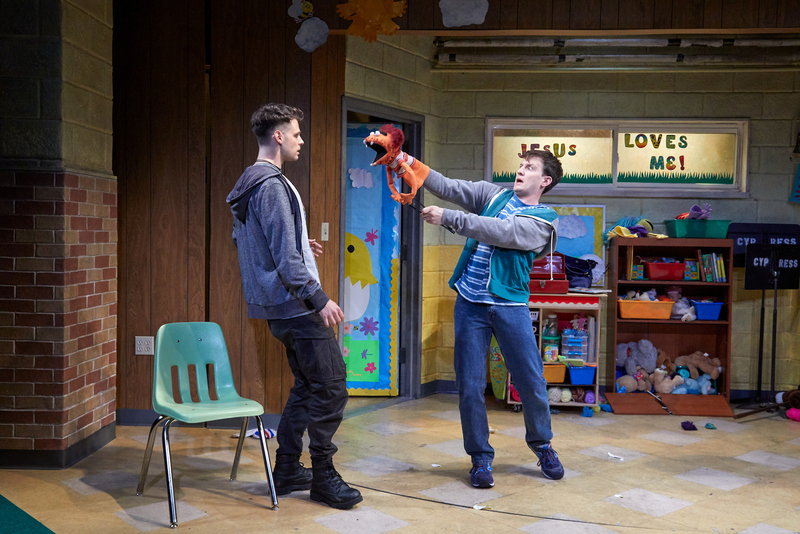 Hand to God, currently in production at TheaterWorks Hartford, is the deeply affecting story of the troubled teenage boy Jason (Nick LaMedica) and Tyrone, the puppet that speaks for him, whether he wants it to or not. 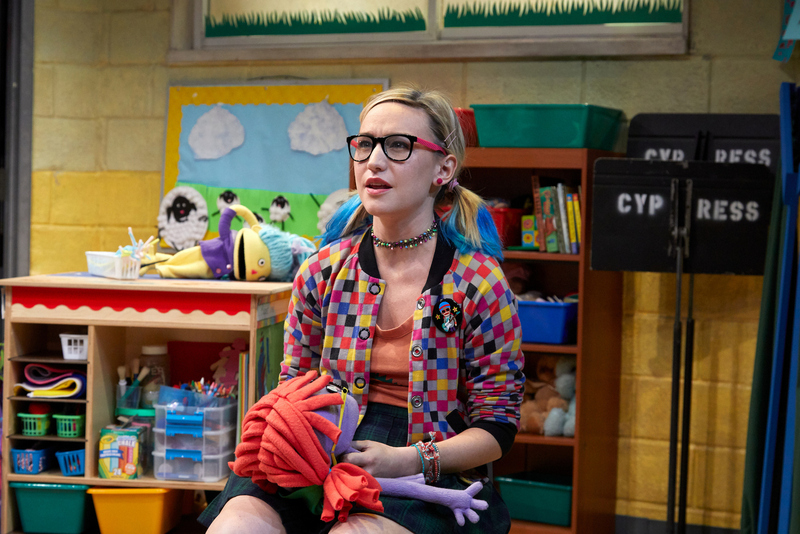 The lone voice of reason in Hand To God, according to Newtown Bee Theater Reviewer Elizabeth Young, is Jessica, who is played with a matter of fact honesty, compassion and humor by Maggie Carr. "She imbues her character with a nature which is both relatable and admirable," Ms Young wrote of the actress in the current TheaterWorks Hartford production. Timothy (Miles G. Jackson), Tyrone the puppet and Jason (Nick LaMedica), in a scene from TheaterWorks Hartford's production of Hand of God.